You’re probably well aware of how important business proposals are to getting clients and winning new business. If you’ve been writing a lot of them, you may have thought about investing in proposal software to make the process easier. However, is proposal software really all that great compared to writing the proposals yourself? It turns out that there are quite a few reasons why you would want dedicated software for proposal writing. Here’s the thing – writing isn’t as easy as it seems. For sales purposes, writing can be extremely daunting. If you’re great at closing sales, you don’t necessarily need to be a good writer. On the other hand, hiring a writer every time you need to send out a proposal (or having someone in-house) is just not practical. Proposal software ensures you spend less time writing, as it comes with pre-made templates. Some apps, such as Better Proposals, come with templates for different industries, such as marketing or website design. All you have to do is fill in the blanks. Alternatively, you can create your own template based on a proposal that worked for you and edit the main information every time you create a new proposal. By spending less time on writing, you will be able to spend more time learning about your clients and getting new leads. One of the biggest issues with proposals in document format is that their use is very much limited. Modern proposal software comes with a range of different integrations that ensure your proposal is embedded into your sales process. For example, you can pull data from your CRM into your proposal software, making it easier to fill out your proposal template. Moreover, your proposal will be added to the sales pipeline. Once the proposal goes out, you can integrate it with your project management tool to have a birds’ eye view of the progress of the deal. In essence, integrations save you time, make creating proposals easier and let you be in full control of the sales process. If your chosen proposal software doesn’t have native integrations, you can hook it up with Zapier and the possibilities are endless. Besides writing, another thing that sales professionals aren’t always skilled at is design. Who’s to guess which color goes well with blue and where you need to put your logo to make the proposal look aesthetically pleasing? Proposal software eliminates this problem by giving you visual templates and all you have to do is edit the written content. Besides the general appearance, you can change font colors, headers, insert your company logo and much more. Why does all of this matter? Proposals with a cover convert better than those without one. Even if you think appearance doesn’t matter, first impressions are crucial to getting your proposals signed. When writing proposals in word processing apps, you usually save them as text or PDF files. Unfortunately, that doesn’t always end up looking all that great. 34% of all proposals are first opened on mobile platforms. Proposal software makes all your proposals optimized across devices, so you make a great impression, no matter the device the client is using. One of the recent developments in the world of business proposals is live chat. You can use a live chat app to communicate with the client as they are reading the proposal and answer any questions they may have. It turns out that it makes a difference – you’re 13.2% more likely to win the deal if you use this feature in your proposals. For anyone working in B2B, you probably know the struggles with unpaid invoices. According to research, the average company has invoices unpaid for up to 90 days. However, it doesn’t have to be this way. When research was done on over 180,000 signed proposals, the average proposal was paid about 12 hours from the moment it was signed. There are several reasons for this. First, you can pay directly from the proposal, which reduces friction and makes payment simpler and easier. Second, half of all payments (52%) were made through credit cards (using integrations with Stripe, Paypal and similar). The remainder was paid either directly or through invoices. This means that a large portion of your clients may be delaying payment through invoices simply because they find credit cards more convenient – which is an option you can set up in your proposal software. It’s fairly common to send out your proposals as PDFs. It’s what your clients are used to – you just attach them and send out in your emails. The clients print them out to review them and hopefully sign. Well, research has shown that PDFs are the number one conversion killer for business proposals. On a fairly large sample, we discovered that sending your proposal as a PDF means decreasing the chances of the proposal being signed by as much as 78%. It’s not that something is inherently bad about PDFs, it’s just they tend to get printed. And once a proposal gets printed, the likelihood of signing plummets. The reasoning behind this may be that a proposal printed on paper gets shared among several stakeholders, decreasing the chances of being signed. There are plenty of reasons to incorporate proposal software in your sales systems. Not only will you write proposals more quickly, but you will also get paid more quickly, have your proposals optimized across devices, have the option of live chat within the proposal and much more. If you’re still sending out proposals in PDFs as email attachments, it’s high time you jump on board the proposal software revolution – your business will thank you for it. The video above is a replay of a recent live webinar I hosted with guest Viveka von Rosen. Combined with the text below you should have a pretty good feel for how to use LinkedIn to generate sales conversations. LinkedIn is the oldest social network. Everyone seems to be on it, but no one seems to know quite how to use it to generate sales conversations. To help us take advantage of this massive opportunity, today I brought in Viveka von Rosen. She is the co-founder of Vengreso, a leading digital sales transformation company. She is also the author of two books on this very topic, LinkedIn Marketing: An Hour a Day and LinkedIn: 101 Ways to Rock Your Personal Brand. She talks with us about how to use LinkedIn to generate real sales conversations by sharing meaningful, engaging content. While she speaks specifically to LinkedIn today, the principles behind her advice can be applied across all other social networks. If you go into LinkedIn with tunnel vision towards sales, you’re missing the entire point. Think about LinkedIn as a networking event—would you go up to someone at a conference and immediately ask them to buy your product or service? Of course not! The same principles of offline networking apply on LinkedIn. The best way to get to know people on LinkedIn is to educate your audience. This positions you immediately as helpful and useful, which in turn builds positive sentiment. Suddenly, you’ve transformed from pushy salesperson to an advocate and thought leader in your industry. What Does Content for Sales Engagement Look Like? When thinking about content, it’s important to consider both the content you create yourself and the content you share that comes from other sources. Each type of content has its own set of rules to create the greatest levels of engagement and generate real interest and real conversations. Whatever type of content you’re sharing, you want to be sure you’re doing it consistently. You should be sharing content at least once a day. One way to help you reach this goal is to establish a sharing community. Contact friends and influencers in your network, asking them to make a pact to share each others’ content. This will give you a steady stream of curated content to share with your network and will help to ensure that the content you’ve created is getting a wider reach. Status updates on LinkedIn are very similar to updates on other social networks. 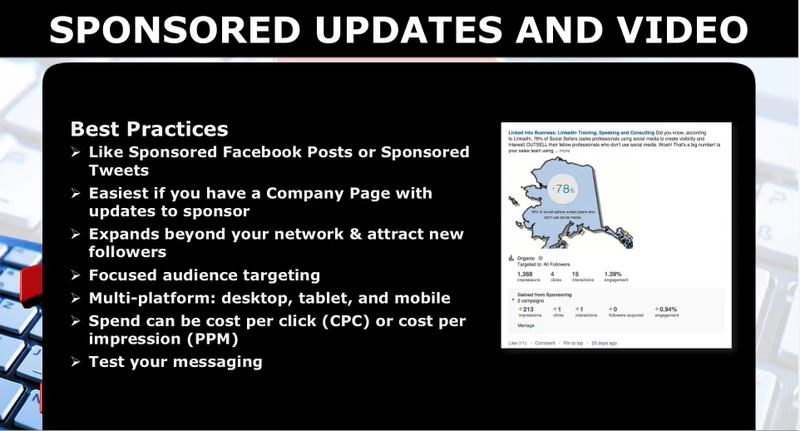 There are a number of best practices for creating status updates that will get greater reach. Following these tips can help your posts get ten times greater visibility. Include hashtags. Hashtag communities is a newer feature on LinkedIn that allows business owners to follow the topics they find most relevant. If you create content with a particular hashtag attached, it will likely be shared with the individuals who are members of that hashtag community. This gives your content a wider audience beyond your personal connections. The trick here is to not over-hashtag. Aim for three or four hashtag community hashtags and one additional hashtag that is unique to your brand. Make mentions. When you’re talking about someone specific in your post, mention them so that they’re notified. You can mention others who are not directly a part of the update, but who might find it useful. Again, moderation is key; keep mentions to a handful of people who are influential and will find the material relevant. Use all the characters. You’re allowed up to 1,300 characters per post. Be sure to use them! More characters means more keywords, which in turn means greater visibility. Research has also shown that longer posts are more likely to be read. Use emojis. Emojis can be a great way to add some visual interest to your post and set you apart from the sea of text-only updates. Keep your audience in mind, and select emojis that are appropriate for your business and clientele. Add native video, images, and links. Doing so will limit you to 1,200 characters, but the added visual interest can also help you to stand out from the crowd. Native video is uploaded directly from your browser or your phone and imbedded in LinkedIn. It is not the same as sharing a link that sends users to an outside video site, which LinkedIn discourages as it drives traffic away from their platform. Sharing native videos gets you more views and attention on the site. Because video content can take a bit longer to create, it’s not necessary to share video each and every day. But know that native video garners incredible results, so the more regularly you can create and post video content, the better. 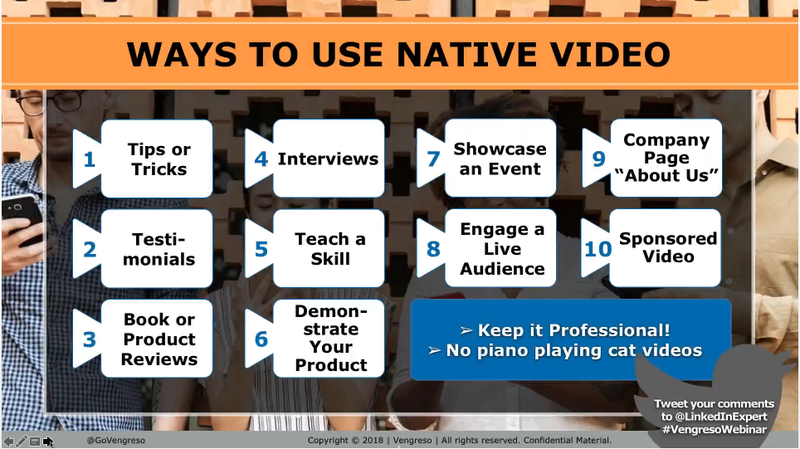 From tips and tricks videos that can help your audience solve relevant problems, to interviews with thought leaders, to the relatively new “about us” videos that you can put on your company page, there are a lot of great ways to create native video. LinkedIn Articles used to have far greater reach. In recent years, LinkedIn has shifted focus to other forms of content, and so posting articles does not have the same kind of power to create visibility as it once did. However, if you’re already writing a blog post for another forum and want to put it into LinkedIn as an article, it can help to amplify your reach beyond your company’s website. The posts are searchable, can possibly be distributed on a pulse channel, and the content becomes a permanent extension of your personal brand. LinkedIn advertising can help you to raise awareness and get the word out about your brand to a new audience. LinkedIn now allows you to sponsor content on your company page, which can help to build followers and reach for your content. There are a number of different types of ads available to companies on LinkedIn. Sponsored content. When you share an article, video, or images on your company page and you want the content to get greater visibility, you use this type of ad. Dynamic ads. This option allow you to personalize your messaging to prospects, with ads that appear on the side bars of users’ LinkedIn pages. Text Ads. Similar to the dynamic ads, but smaller and not personalized. Split testing on text ads is very simple. These are best utilized for top of funnel content. Sponsored InMail. This allows you to send targeted messages to those who are most likely to have an interest in your business. Dynamic ads, text ads, and sponsored InMail are significantly more expensive, so for small business owners, sponsored content is generally the most viable option. There are several types of sponsored content you can create: you can drive traffic to your website or content, build lead generation forms to collect contact information, or increase video views. From there, LinkedIn will prompt you to select the specific post or video you’d like to promote. 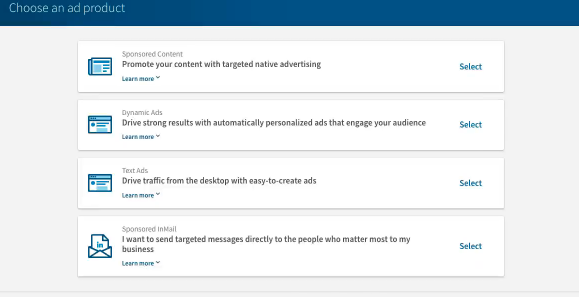 Next, you can indicate to LinkedIn who your desired audience is and establish your budget for the campaign. It’s better for you to be specific in identifying your target audience. Establishing five campaigns to 1,000 people each is more effective than creating one campaign for 5,000 people. Creating audience groups allows you to segment your audience, personalizing the description on the same content you shared with other audience groups. This personalization can attract greater attention from each subset of your audience. The other LinkedIn ads trick is that if you want more views, you should select pay-per-click, and if you want more clicks, select pay-per-view. This is a way to get the most out of your marketing dollars. It’s not enough to just create and curate great content; once people begin reacting to what you’re sharing, you need to follow through! Keep an eye on who’s liking and sharing your sponsored content. Hover over their names to learn more about them: Do they seem like they might be a good prospect for you? If so, reach out with a request to connect, thanking them for engaging with your content and opening the door for further discussion. John Jantsch: Marketing has never needed sales more and frankly, sales people have never needed marketing more than they do today. In this connected world, where people can find out whatever they need to find out, do they really need sales people? In this episode of the Duct Tape Marketing podcast, we talk with Pam Didner. We’re going to talk about effective sales enablement, collaboration, getting marketing and sales together. Check it out. Hello and welcome to another episode of the Duct Tape Marketing podcast. This is John Jantsch, and my guest today is Pam Didner. She is a content marketer, author, speaker, and has a new book called Effective Sales Enablement: Achieve Sales Growth Through Collaborative Sales and Marketing. So Pam, thanks for joining me. Pam Didner: My pleasure. And you are based in Kansas city? John Jantsch: I am in Kansas City, Missouri. Pam Didner: How is the weather today? John Jantsch: It’s beautiful today. Well, I don’t know, it’s actually, summer’s hanging on a little longer than I’d like to do. It’s about 90 and humid. Pam Didner: Oh my gosh. John Jantsch: So, we’re waiting for that first fall cool weather to break. Pam Didner: It’s coming. It is coming. John Jantsch: All right, so let’s define the term sales enablement. That’s one of those terms that I bet you could get a whole bunch of people that define it in different ways. So what’s your definition of sales enablement? Pam Didner: Yeah. In general, if you talk to anybody in sales anywhere in the world, they tend to define that it’s related to sales development and sales training. But for folks who are listening, if you actually look for a sales enablement definition, it’s usually related to development and the training of a sales team. And my book was written from a marketer’s perspective. Interestingly enough, I was never a sales person, but I have done multiple different jobs supporting indirect sales, and also the sales team. And I feel that there are things that marketing can do to actually support sales. So the way I defined sales enablement for my book is to deliver a positive customer experience by equipping sales with knowledge, skills, processes, and tools, through cross functional collaborations, obviously that’s between sales and marketing, in order to increase sales velocity, sales retention, and also productivity. It’s a little bit long, but if you’re thinking about the purchasing cycle in the continuum, obviously via time we’ll pass the baton from the marketing to a sales team. At the end of the day, we want to make sure we deliver that seamless customer experience. John Jantsch: That’s interesting. I have a little history with this. I actually wrote a book called Duct Tape Selling. The sub title is Think Like A Marketer, Sell Like a Superstar. I was actually writing to sales people saying, “Hey, you need to start acting more like marketers.” So maybe a little bit similar. Here’s what I kept hearing from people when I’d go out and speak about this. That’s great, but sales and marketing have different goals, different priorities, different support systems, they’re even compensated differently. That was the pushback of hey, how do we get these guys together? So what have you found, how have you found, because I’m sure you’ve heard that same thing? Pam Didner: Yeah. You are totally right. It’s interesting enough that sales and marketing work in the same company. They even have the same business goal. Drive revenue. But they always have some sort of a misalignment, and I think a lot of the misalignment has to do with two things. First one is long term versus short term, right? If you talk about sales people, they have to meet quota every single quarter. Then if you talk to the marketers, they are building a brand awareness. Obviously it’s a much longer term beyond just one quarter. Another thing is the top of the funnel versus the bottom of the funnel, because the marketers tend to focus on the demand end, especially in the very beginning of the purchase funnel, and also building the brand awareness. Again, that’s on the top of the funnel as well. But if you talk to sales people, they tend to focus on the bottom of the funnel, right? They want to drive conversion, they want to drive the sales closure. That also cause a little bit of the misalignment between the sales and marketing. With these short term versus long term, top of the funnel versus bottom of the funnel priorities, that obviously have a huge impact on the resource and the budget allocation when you move down to a technical level. The way that I see that both sales and marketing work together, is you need to find some sort of commonalities within the misalignment. One of the great way to actually drive that is account based marketing. Obviously, especially for the technology and the complex sales, that they are specific accounts the sales people go after. And account based selling is nothing new, but what about working also with the marketing people to tailor and customize some of the marketing campaigns and outreach for a specific account. That’s just one example, if you will. It’s looking for commonality within misalignment. I think that will be the first step to do. John Jantsch: Okay, here’s the really tough question to get us both in trouble. In that description, and in the traditional sense, do we even need the sales function anymore, then? Pam Didner: That’s actually a very good question. I still think sales function is absolutely necessary, and I am a marketer. I never can qualify myself as a sales person. And I think marketers need to think that the sales is just another marketing channel, and sales people need to think that marketing is another hidden sales force. Does that make sense? They complement each other in a way, and I loved supporting my sales people when I was in the corporate world. But I don’t think I can do their job. I still think that sales people provide a huge amount of value, and to bring the revenue actually to the company. I don’t think marketing can actually take that 100%. John Jantsch: [inaudible] always described the difference between sales and marketing is that marketing controlled the message and sales typically controlled the client relationship, and was much closer to the client. How do we get marketing closer to the client? Pam Didner: I think there are multiple ways to do that, but before I talk about that, John, you brought a very good point. Traditionally, marketing tend to focus on messaging and sales focus on client relationship. With the rise of digital, especially in social media, don’t you think that marketing is actually doing some of the customer services? And also managing the client relationship, right? Because you have to talk to the customers and it’s no longer just one way communication, it’s actually a two way communication. So I actually see the modern marketers are taking on some of the client relationship on its own, naturally, just because of digital technology. That’s one way I’m looking at it. John Jantsch: Not to mention the data that we now have. I think that the segmenting is better, personalization of content is better, and so I think all of those elements have … I think a lot of people are missing the boat by not using those elements to get closer as well. Pam Didner: Yes. You are totally right. Leveraging data is actually a great competitive advantage, if you will. Unfortunately, to be honest with you, my generation, probably along with yours, we kind of grew up with traditional marketing. So data, looking at data day in and day out is not necessarily what traditional marketers do. I have to intentionally learn, and make an effort to do that. I agree with you that something, especially probably for the millennials that come into the workforce, that will come naturally to them. But at least for the existing workforce that’s currently in the marketing field, this is something that we still have to learn. Does that make sense? But I do agree with you 100%. Pam Didner: Yeah, John. How dare you? John Jantsch: What does today’s sales person need from marketing, though, so that they are relevant? Pam Didner: I think there are multiple things that the sales team needs. In the past, I think sales people can be a super hero. They can do a lot of client relationship, accelerating the purchase funnel on their own. But in the current modern world, you need a team to support you. You cannot do anything on your own anymore, if you think about it. I think the marketing team can be the back end to actually support a sales team, and there’s multiple ways that the marketing team can do, right? In addition to give the sales people MQL, which is marketing qualified leads, marketing people have done email marketing inside out. They probably know how to optimize that, and I know a lot of sales people do many email marketing campaigns on their own for their prospects. So getting the tips and tricks from the marketers doesn’t hurt. And social media, obviously, marketing people are pretty much on the front of that. Again, tips and tricks and teaching sales people how to do that better doesn’t hurt. Social selling is related in terms of how to do research of your prospect on LinkedIn, on social media, and using the hash tag, and what of and keyword search. How do you use keyword search, how do you use hashtag properly? Again, marketers can provide some help. On top of that, there’s a lot of messaging, even content, that marketers create. If you think about it and try to map the customer journey along with the sales processes and also methodology, there may be some content on the marketing side that can also be used on the sales side. If it cannot be used, obviously it can be modified and customized in certain way. So the content sharing between sales and marketing is another way that marketing can contribute. And the last one, if you will John, a lot of the stuff that marketing people are doing can easily be part of a sales on boarding, and so is training. How to do social selling better, how to actually do research better online. All this can be part of the on boarding training and continuous training of the sales people. So there are multiple ways that marketers can contribute. I’m just sharing with you several examples. John Jantsch: Now, one of the things that I’ve encountered in talking to a lot of sales people over particularly the last five to seven years, is that some of them got tired of waiting for the company, for the company culture, to shift and bring sales and marketing together. A lot of very successful sales people have said I’m just going to go out and build my own reputation. I’m going to blog, I’m going to participate in social media, I’m going to get speaking at maybe regional conferences where my customers might be there. In your opinion, should companies go as far as elevating their sales people in those veins? Pam Didner: I think it’s actually good, but there’s a couple of things I want to address. If you are actually in a small business or, I would say, a mid size company, and having sales people speak and talk about the brand, is probably not their thing. You want everybody to talk about your brand and also your product, and you become a brand ambassador or your company’s ambassador to promote your products and services. However, in the bigger enterprises that be hundreds or thousands of a sales force, they usually have a policy and also processing place to do that, and you need to understand your corporate policy and make sure there’s no code of conduct violations, or whatnot. Right? And if you actually go out and talk about your products, sometimes you have to use examples. And say if you talk about specific accounts, will the other accounts be mad that you didn’t mention them? John Jantsch: “Those idiots in marketing aren’t sending me any good leads!” I can hear people screaming that. Pam Didner: Yeah. This is something that, you’ve got a good point, John. From my perspective, if that’s the case there should be a very honest conversation between sales and marketing. At the end of the day, you’ve got to have a come to Jesus meeting. You know what I’m saying? And the sales people need to be very frank and say I’m doing all this because you are not giving me stuff. And now, what can we do or what can you do, to actually help us out? So I think at the end of the day, it’s the service level agreement that needs to be finalized and also communicated, so sales can do their jobs. But if they feel that being a brand ambassador or company’s ambassador that can get them leads, I don’t know. It may not be a bad thing. What do you think, John? John Jantsch: I’m a big fan of it, but I do know that it’s like everything, it’s fraught with land mines as well, potentially, when you’ve got shareholders and things to consider. But in the small business, which quite frankly, I have a lot of small business owners as listeners, and I think that they should find ways to … If I was considering making a purchase and the sales person from one company was speaking at a conference I was attending, and the other people were just sending me brochures, to me that would be a great competitive advantage. But again, it’s probably individual considerations. Pam Didner: I do agree. And individual company considerations, yes, absolutely. John Jantsch: Absolutely. I’ve always said that one of the best sources of lead generation is happy customers, and a lot of companies are investing pretty significantly in customer experience and service. So how could a comamonas use that investment as a way to help sales? John Jantsch: The kind of stuff that would generate raving fans and referrals, and things like that. Pam Didner: Yeah, I totally agree that customer service or the post sales experience is incredibly critical, and this is so true, so true for technology companies or SaaS based products, because when you offer any kind of SaaS based products, there’s always a learning curve, right, that the user has to go through to get familiar or get competent and efficient with your tools. The post sales is very critical in terms of getting cross sales and also up sales in the future. And fortunately, the customer service department is not a necessary part of the sales team or part of the marketing team. They tend to be a team of its own. What I have come to realize, especially working in the marketing side of things, at the end of my job in the corporate world, I got a chance to actually work with the customer service team, because understanding what kind of questions they ask actually helped me to determine what kind of content I should create. Does that make sense? We also feed that kind of information back to the product team. So when they created next version or next generation of their product, some of the features can be incorporated. On top of that, some of the key learnings or the questions that were asked as part of the customer service team, we tried to feed into a sales team so they can get kind of like first hand information and just give them a heads up that when they implement certain tools, there’s a couple glitches they may encounter, and the sales people can prep their contacts. It’s interesting how customer service in the past tends to be a division of its own. Now a lot of the data they collected, and John you mentioned how important data is, that is feeding back to the marketing for the content creation, and feeding back to the sales team to improve their client relationship, and even the product development. So I think it’s very critical to actually have that relationship with the customer service team as a marketer. John Jantsch: So if we are going to have effective sales enablement, what does the new sales-marketing-service team look like? Does it have to fundamentally be changed in how we structure that in organizations? Pam Didner: That’s actually a good question. In an enterprise, it’s almost impossible, right, to change the organizational structure and the sales team and the marketing team will continue to actually have their differences. I don’t think we can overcome that overnight, per se. And the way that I recommend it in my book is, you need to take some baby steps. If there’s a huge or there’s a big gap between the sales and marketing, is it possible you could find some sort of commonality and start it with small initiatives, for example. The second thing is, if there’s already some sort of misalignment but can you make that alignment even closer and drive multiple different joint initiatives together? I don’t think the two circles will completely overlap, and my recommendation is make an effort to align as much as possible, but be aware that the sales and the marketing team always have different goals. John Jantsch: But you know what? Get somebody from marketing and go get them in the car, and go call on some accounts with them. Pam Didner: Actually, I do agree with you, and that’s one of my recommendations in terms of trying to understand sales processes and sales methodologies is to shadow the sales person for a day or for a week. If nothing else, they can get a sense of the pain of the sales people for the continuous rejections. But yes, it is very important to actually try to understand sales issues and concerns in order to better support them. John Jantsch: Speaking with Pam Didner, author of Effective Sales Enablement. Pam, where can people find out more about you and your work and your book? Pam Didner: Excellent questions. You can always google Pam Didner, D-I-D-N-E-R. And I also have my own website, pamdidner.com. Just go there, check it out, I blog and I also have a podcast, Seven Minute Marketing With Pam, and the book Effective Sales Enablement will be launched on October 3 in the UK, and on October 23 in the US. And you can obviously pre order on Amazon. The things I really want to share with your audience is that if you purchase my book, and you read the book, and you discover absolutely nothing, nothing usable in the book, schedule a call with me. More than happy to actually help you out. Tell me your challenges, I will see what I can do. John Jantsch: Awesome. That’s about as good a guarantee as you’re going to get from an author, so Pam, thanks for making that offer and we will obviously have links to everything in the show notes when you check this out, so Pam, thanks for joining us. Maybe we’ll catch up with you out there on the road sometime soon. Pam Didner: My pleasure. Thank you so much. This week on the Duct Tape Marketing Podcast, I chat with Pam Didner. After almost 20 years in corporate America, where Didner held a variety of senior leadership positions in departments as varied as finance and accounting, supply-chain management, and global marketing strategy, she decided to strike out on her own. Didner is now a public speaker, facilitator and coach, consultant, and author with a focus on global content marketing. 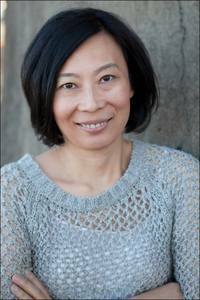 She is the author of two books, including the forthcoming Effective Sales Enablement: Achieve sales growth through collaborative sales and marketing. On today’s episode, Didner discusses her new book, and what small and mid-sized business owners can do to build a bridge between the sales and marketing teams that encourages mutual understanding, fosters a greater internal support network, and helps serve the larger goals of the business. How do you bring sales and marketing together when they have such different goals, priorities, and support systems? Is the sales function obsolete? How technology and data has brought the sales and marketing functions closer together. Why small businesses can benefit from turning their salespeople into brand ambassadors. How to use the information from your customer service team to shape your marketing and sales approaches. When you think of your business’s sales strategy, you may be tempted to think of it as only relating to the actual transaction where a customer pays for the good or service you offer. However, businesses today can’t think of their relationship with their customers as a linear one. Instead, people have the opportunity to interact with your brand in a wide variety of ways: on your website, in-person, over the phone, via email, in Google search, or on social media. And they go through different phases, from just coming to know of your product to (hopefully, eventually) being a return customer who refers others to your business. The sum of all these interactions with your brand is what we call the customer journey. Because this journey is not a straight road, your sales team can play a role in each phase of the journey. As you think about building an hourglass that addresses marketing needs for prospects and customers at each phase, you should also consider how your sales team fits into the hourglass model. Whether someone is hearing about your brand for the first time or is making their 50th purchase, your sales team has something to offer them. We’ll take a look at the stages a customer goes through on their journey of interacting with a brand, and how sales can play a role in each phase. When someone is just encountering a brand for the first time, you have a tremendous opportunity but also a great responsibility. They know nothing about your business, so it’s up to you to create a cohesive image that quickly, easily, and clearly communicates who you are, what you do, and why you do it better than anyone else in the game. These early stages of brand discovery—the know and like phases of the hourglass—are often thought of as the territory of the marketing team. Creating advertising campaigns, compelling calls to action, and social media profiles fall under their purview, but sales has a role to play even this early on in the customer journey. Outbound marketing efforts may well include your sales team. If you undertake telemarketing or cold calling, have a booth at a trade show, or have a giveaway of branded items at a community event, these are opportunities for your sales team to be the first point of contact with prospects. While outbound marketing techniques have become less popular in recent years, if it’s done correctly, it can help you to create positive associations with your brand in the minds of prospects. The key here is in making sure that you have a sales team that’s comfortable with having a conversation that touches on the important differentiators for your brand, but at the same time doesn’t feel scripted. With the right sales team in place, it’s possible to create positive personal connections with prospects immediately, and that really allows you to stand out from your competition that’s relying solely on inbound techniques. The trust and try areas of the hourglass are where there’s the greatest crossover between your marketing and sales teams, and so they should be working in tandem to create that highly personalized approach. In order to be most effective, they need to have access to each other’s information: sales needs to share their CRM data, while marketing should provide a window into their analytics. While some prospects will react well to personalized email campaigns and targeted paid advertising on Facebook, all managed by the marketing team, others will need a bit more hand-holding from someone in sales. Having a call to action button on your website that makes it easy for prospects to request a demo and get in touch with a member of your sales team can help funnel those prospects that need a little extra attention to the appropriate salesperson. Additionally, creating a shared inbox for your marketing and sales teams will allow your marketing folks to easily hand off prospects that would like more, detailed information to the sales team. This is what the sales team has been waiting for. After playing a role in introducing prospects to the brand and being responsive to their questions in the trust and try phases, the prospect is finally ready to convert. Of course, the buying phase of the customer journey where the sales team plays the most obvious role. It’s also a point that some business owners take for granted. Just because someone has become a customer does not mean they can now be forgotten. As Joey Coleman and I discussed in a podcast episode, creating a standout customer experience is an important part of taking people from one-time customer to repeat client. The sales team needs to make sure that the first time someone buys from you, they have an optimized experience. That means automated updates on their purchase, an easy way to get in touch if there’s an issue, and a proactive approach from you. If your sales team is able to provide a stellar experience for a customer’s first time buying from your company, they’re a lot more likely to come back again. The trick here, of course, is that the stellar experience needs to be repeated on each subsequent interaction. Your sales team can never take a customer for granted, because if they do, that customer will eventually drift away to a competitor. Part of the trick here is to establish crystal clear processes for your sales team’s interactions with customers. Make sure you have a customer service platform in place to ensure that any issues are being addressed in a timely manner and that efforts are not being duplicated (which wastes your team’s time and frustrates and confuses your customer). Consider a platform like ZenDesk, which allows you to track customer support requests across channels. The final stage of the hourglass gives your customers the opportunity to generate new leads for you. When you empower your sales team to effectively generate referrals, you can build an engine that fuels your business growth for years to come. Encourage your sales team to be proactive about gathering referrals. If they have a positive interaction with a customer, have a formalized process in place for getting a written review from that person. Customers will also be more likely to refer you if you remain top of mind. Your sales team should be using a customer data platform to track interactions with customers. If you haven’t spoken to one in a while, have your sales team reach out. A personalized email or phone call might not only bring them back to make another purchase themselves, it will also position you to be the business they recommend later in the week when their friend happens to ask if they know a company that does exactly what you do. If you think of your sales team as a group that only springs into action the moment someone wants to make a purchase, you’re missing out on the enormous potential that they have to support your business throughout the customer journey. When deployed correctly, your sales team can be by your customers’ sides each step of the way, which only serves to strengthen their relationship with your brand and makes them more likely to establish long-term connections with your business. There can be a lot of motives when it comes to marketing. Some campaigns are created to increase brand awareness. Some are created to generate leads. And some are created to generate direct sales. Despite the original motive of the marketing campaign, in the long run, there is only one end game — more conversions. No matter what each business classes as a conversion, that conversion is the reason why millions are spent on marketing each and every week across the globe. But what marketing materials actually work? Each day hundreds of marketing campaigns are thrust in front of us. Open a newspaper and there’s an ad for a new mattress. Load up your laptop and there’s an ad for some trainers you at last week. Look out the window and there’s a billboard for the latest teeth whitening product. Everywhere we look there’s marketing, much of which we won’t notice. All of this marketing that goes unnoticed is either not very good or is poorly targeted. The first step of any good marketing campaign is engagement. If you don’t get the right things in front of the right people then how can you ever expect them to convert? In today’s society, there are of course many ways that you can reach people with your marketing. But what about marketing that doesn’t happen on the internet? Many people will have you believe that offline marketing is a dying art, but that’s not the whole story. There are still many ways in which marketers or business owners can utilize ‘old-school’ marketing. Take event marketing, for example. There is still a lot of value in building relationships on a face-to-face level, and there are marketing materials that can help with this. For example, a recent study by digital print experts Purely Digital showed that people are far more likely to engage with marketing materials such as leaflets and scratch cards than a wristband or sticker. Having managed to get the initial engagement it’s then crucial to provide a high-quality user experience. If the marketing material (no matter what it is) proves a challenge for the user then anybody who initially engages will soon lose interest, which is a potential opportunity lost. User experience is something that has become more and more important with the evolution of technology. There are now many more options out there for each individual. If you engage with a piece of marketing and it’s difficult to interpret or find what you’re looking for then you have the option to move on — and this is extremely true online. Nowadays Google is placing a great deal of importance on UX. It used to be the case that with a few high-quality links and some well-written meta and title tags you’d be able to earn yourself a reasonable standing in the SERPs. Increased competition has meant that this is no more. A website needs to provide the user with an experience that makes people want to come back. What happens when a user is actually on a site now plays a big role in how Goole perceives that site. As mentioned, the user experience is key. But it’s also important that businesses don’t forget the initial reasoning behind their marketing campaigns — the conversion. Getting the conversion from a marketing campaign links in heavily with the user experience. A good marketer will be able to plan a user experience and journey that leaves the conversion an inevitability. For the best in the business, leaving things to chance is not an option. Whether it’s a marketing campaign that begins with putting flyers through doors or a highly specific remarketing campaign online there are certain things that can be done to boost conversion rates across the board. One of the major things that can lead to high conversion rates is ensuring that your marketing targets the right people. Panoptic Media added: “One of the major problems we often see when people come to us is that they aren’t sure who they’re targeting, or who they should be targeting. When it comes to selecting marketing materials it’s not a case of one or the other. A good marketing campaign should take somebody on a journey. And whether that journey incorporates one, two or much more different marketing materials and avenues, as long as the user gets what they’re expecting at the stage of initial engagement then there’s no reason that you won’t get the conversion. 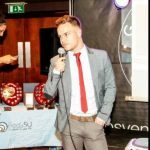 Aaron is the SEO Manager at Converted focused digital marketing agency. He is extremely focused and passionate about boosting SERP rankings and driving good quality traffic to websites. “Good traffic is traffic that interacts and subsequently converts”.